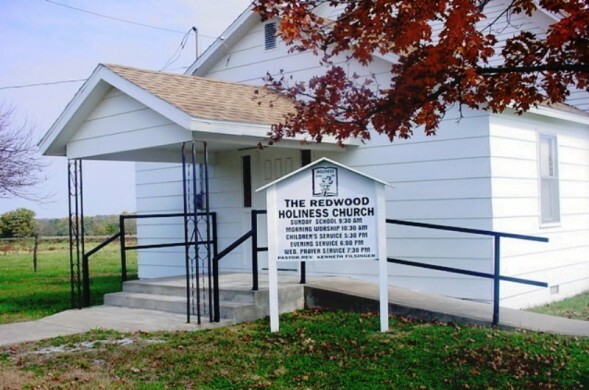 The Redwood Holiness Church and the Davidson family have a shared history, ordained by God that began before there was even a building. 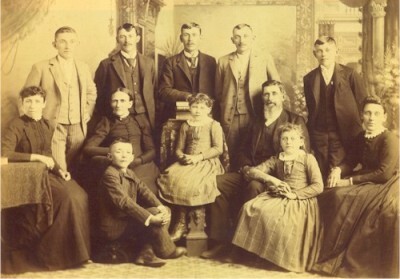 Luther Albert Davidson and his family were one of the founding families of the church. From those early revivals, a group began meeting in the Redwood School. They continued there for 13 years. During that time there was some opposition to the group holding services at the school, the subject was brought before a school board meeting by some members of the community who were adamantly opposed and a vote was held. The outcome was 33-32 in favor of letting the meetings continue. 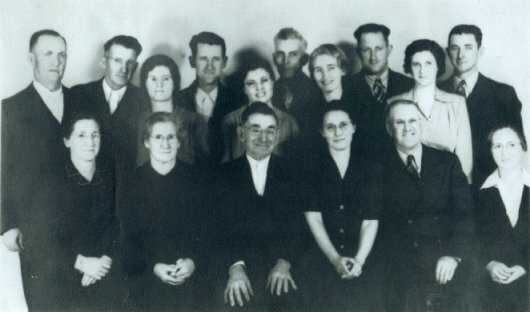 The families included in that early holiness group were, "Davidson, Dodson, Crain, Burkey, Stailey, Armstrong, Willoughby, Lowe, Motley, Spencer, Houck, Shimp and Bass." According to early minutes, a business meeting was held November 28, 1925 and a committee was formed to oversee building a permanent home for their worship services. Officers were chosen with Hugh Willoughby as chairman, Olive Willoughby as Secretary/Treasurer and trustees were A.R. Motley, Hugh Willoughby and L.A. Davidson. By January 1926 they agreed on a selected plan for a 1500 sq.ft building on 1/2 acre of land donated by Henry Hirshey. George Motley donated logs from his land and Len Houck sawed the logs at his saw mill. Art Spencer and Ed Cale were hired as carpenters and men from the community donated their labor (41 names were listed as donating their labor). Charley Garber was hired to build the pulpit, which is still in service today and the seats came from Mt. Vernon German Lutheran Church, costing $8.00 each, and are also still being used. Hugh Willoughby served as the first pastor and in 1951 a building was moved in east of the church for a parsonage and a well was drilled. Oliver Allen, Hugh Willoughby, Florence Martin, Paul Smith, C.C. Hamm, Mattie Chance, Wayne Rogers, Warren Gaddy, Don Hazelwood, Lester Sharples, Forrest Robinson, Paul Chrisenberry, Tom Wade, Lyle Bass and Kenneth Filsinger. My grandfather, Luther Davidson and his family were included in those who donated their labor. James Madison Davidson: The Davidsons were Northern Methodists. My great- grandfather, James Madison Davidson came to the Sarcoxie area from Illinois in the late 1800s. He was quite successful—farming and raising cattle, building houses and was known and respected in the community. He was a landowner, a map from 1895 reflects 240 acres. My uncle told me he grew 100 acres of strawberries on that farm. He belonged to a fruit-growers association and also served as president of that organization for at least two years. He and his family were members of the Methodist Episcopalian church, as many in that area were. He was helping his son move a barn in August 1911 when he drove a rusty nail through his foot and died from tetanus a week later. He had sold part of his farm and had built a home in Sarcoxie which he was living in at the time of his death. There was no cure for tetanus and it was a horrible death. I never understood the fear of God the Davidsons had; I knew no other family like them, but God has shown me that what happened to my great-grandfather had a great effect on Luther and all his family. James Davidson had lived with them for a time after his wife’s death in 1909 (according to records) and that would have given the children an opportunity to become closer to him. God in his great mercy dealt with my great-grandfather’s heart that he would be saved and spend eternity in heaven and in his great trial, his offsprings’ hearts were also being prepared to turn to the Lord. My Aunt Neva Dodson, Luther’s oldest daughter, wasn’t quite sixteen when her grandfather died. I knew Aunt Neva well, she was a beautiful woman and commanded great respect when she spoke. Sometime in the 1900s she went to a revival meeting and was saved. I’ve personally heard her share this and my Dad also told me this story several times. That experience had an effect on all her family—both parents and siblings. Luther Albert Davidson: My grandfather Luther Davidson was a dirt contractor, building roads, dams, straightening creek channels, etc. My dad had just completed his freshman year of high school in 1922 and my grandfather and all his children and spouses moved to the Rolla, Missouri area to work on a section of what became Highway 66. While there, he decided he could no longer continue doing business as usual, and told his family and crew that when they finished the section of road they were on they were packing up and heading home. At that time, construction was done with horse-drawn equipment and he owned fifty draft horses. They returned to the Sarcoxie area where Granddad continued to work locally. The Davidson’s have a family connection to S.D. Bagby by marriage. My great-grandmother, Margaret (Whitaker) Long-Rentfro’s brother, William W. Whitaker married Martha Bagby, a sister of the evangelist and they lived near Reeds, Missouri. Sarcoxie is only about six miles from Reeds. We have a written record that my Aunt Neva visited John Whitaker’s home (another uncle) when she was 12, which was also near Reeds. I grew up attending Redwood Church and I listened to others tell about my grandfather Luther Davidson being instrumental in building and establishing it. My cousin, Wayne Davidson told me he remembered riding on the wagon taking the logs to the saw mill, he was about three at the time. I was born in a house on a forty-acre farm, that joined James Madison Davidson’s 240 acres on the northwest. That house is still standing. I heard a number of holiness preachers/evangelists when they came to Redwood, but there were two that seemed different, Levi Burkhart and Elliott Hodge. Levi Burkhart: Levi Burkhart had a very methodical delivery with a lot of scriptures and he spoke at length about the creation and the stars in heaven and the heavenlies and he ministered that to my heart. He opened every sermon with, “I need the prayers of all God’s people.” Paul Smith who served as pastor of Redwood and was a friend and neighbor of our family said Burkhart spent time at his house and he always had his bible with him, usually opened on his lap and there were many verses underlined; that made an impression on me. There was a move of God in the Luther Davidson house in the early twenties when my Aunt Neva was saved. That move of God had begun in Kansas with Benjamin Young, Levi Burkhart, Elliott Hodge, Nellie Johnson and others. God soon brought the holiness movement from Kansas to southwest Missouri. The Neosho Valley Holiness Association (Kansas) was formed about 1880 and was comprised of “…members from existing churches, the majority being members of the Methodist church. They maintained their membership, attendance, and positions in their respective churches, but they banded together for mutual fellowship and worship, and for the promotion of’ holiness"; apparently, little is known about the early Association or its members. Benjamin Young: Benjamin Young was elected the President of the Neosho Valley Holiness Association in 1895. The name was later changed to the Southeast Kansas Fire Baptized Holiness Association and it eventually became “The Bible Holiness Church.” He remained president until his death in 1920. His daughter, in her book, stated that her father was “…a man full of ambition and looking forward to becoming one of great wealth.” He did just that, becoming quite successful as a famer, rancher and landowner. He married Elizabeth Burkhart, Levi’s sister and they raised four children. He was a member of a little Methodist church in Angola, Kansas and the church was anticipating a revival. They voted to have the evangelist Reverend Rollins and the meetings commenced. Young was quite stirred up by the nightly messages and challenged the preacher, telling him they wanted Methodist doctrine and was ready to have the meeting closed down. Young’s daughter quoted the reply of Rollins, “Brother Young, if I can’t preach a salvation that saves from sin, which I believe is Bible doctrine, I’ll return to my home. God’s word says: ‘The wages of sin is death but the gift of God is eternal life through Jesus Christ our Lord…” She describes her father being convicted and finding “…forgiveness at the foot of the cross.” Benjamin Young’s life was changed. He felt called to preach and whole heartedly joined the holiness movement. He was forty years of age. Young also established a home for orphans, mortgaging his own farm to buy a farm of 210 acres with a large home and barn and several outbuildings. He asked my aunt and uncle, Claude and Neva Dodson to move to Independence, Kansas and farm the orphanage property. They arrived at the orphanage December 31, 1919, traveling by horse and wagon with their belongings. They remained there for three years before returning to Missouri. Benjamin Young was injured in a car accident that November, and died the following January, not living to see the opening of Door of Hope Orphanage. Levi Burkhart became the president of the Association following the death of Benjamin Young. Those people had faith, they didn’t have the Holy Ghost, but they had faith; my grandfather had faith. When my mother was sick and they didn’t think she would live, he would come to our house every day and pray for her. One day he told me and my three sisters a testimony about a lady who was sick and her children prayed to the Lord and said, “If you don’t do something for our mother, we are going to have to take her to the cemetery.” After Granddad told us that story, he had us kneel down together and pray for our mother. After that prayer, she began to get well. Granddad was an easy-going man, jovial, yet sober. The people I grew up were like that, sober, sensible, hardworking and not showy. Growing up in Redwood, I watched and listened to this group of people that were taught what John Wesley taught. I’ve studied John Wesley’s teachings and I know he taught good things, straight things, had a good intellect, he spoke the words as they were written though it was without the Holy Spirit. But about the time of Pearl Harbor and WWII, people moved into our community that weren’t so sober. The church was small but during the warm months, we would have the windows open and there would be people outside all around the church, sitting on the fenders of their cars and such, listening, often up to 200 people. They were emotional and would begin shouting and that was new to me, new to our family and many of the people of Redwood but they let it go on. However, when it got to a certain fervor, my grandfather, who sat on the right-hand side of the church, would get up and walk across the platform three or four times singing acapella “On Christ the solid Rock I stand, all other ground is sinking sand…” and the place would quiet down. Luther died in 1946. He had just finished supper and had walked out on the porch and sat down and in a moment he was gone. Lyle Davidson: Luther's son and my dad, Lyle Davidson, had that same faith. Dad was just two years old when his grandfather died in 1911 from tetanus. His grandfather’s death wouldn’t have had the impact on him that it did on the older children, but Dad told me and my sisters that when he was seventeen or eighteen, he was quite sick and God took him down to the gates of hell three times and showed him hell. He took him down and brought him back up and He did that three times. He told me, “Doyle, I saw people in the flames that I knew,” he said, “I wasn’t just born again, I was converted.” He had a fear of God that few people have. My dad ministered faith to me all my life, as did my grandfather. Dad told me often, I was going to have to preach the gospel. I didn’t like hearing that, I wanted him to be still. My mother told me one day that she had prayed and told God if he would give her a son, she would give him back to him. I didn’t know that until I was about fifty years of age. She had kept that to herself, all those years. I was born in 1932 and according to what I’ve been told, I was born with a hole in my heart. The best doctors available told my parents when I was about six weeks, there wasn’t anything more they could do for me. I was told that my mother, in her despair, threw me on the bed and said, “Take him Lord, he’s yours,” and with those words, she fulfilled her promise to the Lord. A neighbor of my parents told my dad that he might as well be prepared to find me dead in my crib some morning. Dad replied, “He won’t die, he will live.” God healed me and I have never had heart problems since. When I was a young lad, I stood on the top of a tailing pile and looked out across the prairie and thought, “One day I’m leaving this place.” When I was eighteen I asked my dad if I could stop going to Redwood; I told him I didn’t think it was doing me any good. With the wisdom of God, Dad said, “Well if you don’t think it’s doing you any good, you ought not to go.” I joined the Navy soon after I graduated from high school and served four years as a hospital corpsman, which included twenty-seven months as senior corpsman in Yokosuka, Japan at the Yokosuka Naval Hospital. After being discharged and returning to the states, I went to the School of Veterinary Medicine at the University of Missouri in Columbia, Missouri, graduated and established a successful veterinary practice, building my own hospital in McKinney, Texas, specializing in equine medicine. But God had visited me in 1958 just prior to entering veterinary school; I was overshadowed by his presence and I heard him say, “I don’t want you to be a veterinarian, I want you to be a minister of the gospel.” I knew fear that day like I had never known, but I could not believe it was God, and I went on to school and graduated. In 1969, the Lord visited me again, and this time I knew if I didn’t obey him, I would be destroyed. I sold my hospital and practice in January 1970, at the Lord’s direction and he soon began divesting me of all my holdings. After spending time in Missouri, working on my farm, I went to Tennessee where I worked on the horse show circuit for a few months. I was baptized in the Holy Ghost in July and baptized in water by immersion in September. Following my baptism in water, that evening I asked the Lord, “Father, what do I do?” and I heard him say, “Return to the land of your fathers.” I did, we left the next day. How important those words were to me that night. To this very day, you couldn’t take Sarcoxie out of my heart. Out of the Redwood Holiness Church, out of the holiness people, God raised up a prophet to the nations. In 1987 God had me prophesy there was coming a great deliverance. In 1988, I believe, I confronted a spirit in a woman with faith. Her grandfather was a Methodist circuit rider. Within moments after challenging that spirit, it shook me violently. Violent shaking, an hour at a time. You’d wonder if you’d ever stop shaking, wake up in the night in bed and be shaking for an hour. I was afraid to drive a car very much, although if it started, normally, I’d get it parked. Three days that thing shook me. I asked God, “Why? Why can this spirit shake me?” He said, “That spirit is a Methodist spirit,” (I didn’t know they had such.) “And you were raised in Methodist doctrine,” (John Wesley Methodist Holiness) and my heart was full of that doctrine and this spirit could get to me, shake me. Three days, I overcame it. The Davidsons came out of a group of Methodist Episcopal, Northern Methodists, maybe they’re the same, I don’t know. 1892 southeast Kansas a Methodist farmer rancher started that group of people. The Davidsons joined up in the 1900s; my grandfather Luther Albert built the second church that was built by that organization. Redwood Church, Sarcoxie, Missouri, southwest on the Jasper, newton County line. I’ve gone all these years obeying God, since 1970, then 1980 started here. In 2008 I encountered a spirit that started dimming my eyes, 2009 more, by June 2009, that was the last time I could read with glasses that I seldom wore. Since that time, it has been one thing after another, 2009 through 2012, I could see, but not well enough to drive or anything else. But in 2013 my vision went, when Kathie read Daniel 11:20-28. I said, “My goodness, I think this is the United States of America. It is. Several weeks back I had Kathie D and Terre Brown read some Psalms to me. That went on a few times, and then it just, I don’t why, stopped. I had in my spirit this week, the one we’re in, [February 12, 2017] was going to be different. I had Kathie D and Terre Brown reading the Psalms to me again; sowing the word in my heart, (parable of the sower, Mark 4, Luke 8, Matthew 13). Oh it’s helping, it’s only been going on two or three days. This afternoon somewhere around 3:00, I had been praying prior to that some powerful prayers and I don’t remember if Terre said, “Would you like for me to read some Psalms?” or if I asked her about reading some Psalms, I think I asked her. She was reading them, I was just sitting there listening, hooking my faith to the words and suddenly I felt the urge, an unction from the Holy One, pray in tongues. I prayed very little, and I saw a spirit, I saw a spirit with my eyes. It was that spirit that shook me in 1988. “Where,” I thought, “has this thing been?” Frankly, I got excited. When Terre she read so many Psalms and when she reads those Psalms, I told her, I want to talk. I told her about this spirit. It’s a divining spirit. I fought it for years, not going to fight it many more, but I’m going to overcome it. No, it doesn’t shake me now, but my shoulders are sore, my fingers, hands, uncomfortable, started January 3, 2017. Glory! I’m pumped up now. I see that spirit. It’s the one I’ve been battling and not knowing what it was, completely. A couple things I’ve noticed: Let’s put it this way, my mother was raised Baptist, my father Methodist. over the last few years, I’ve watched things, I’m a person that pays attention. I’ve heard Kenneth Hagin talk, I believe he had Baptist mother, a Methodist grandmother or vice versa. You, had some Methodist in you, right? [Kathie: yes I did] Terre Brown grew up Methodist. So you see God sent me to Dallas, Fort Worth and then sent me to speak to the people of Plano. Friends this spirit won’t be hanging around my house very long. It’s everywhere in Methodist churches. You know God told me in 1987 there was coming a great deliverance. I wrote about it. Well I wonder if we’re not about to see a real breakthrough among some Methodists? Kathie: I remember when I first came here it seemed like every time you got up to speak, you were after the spirits in Baptists and every time you turned around it looked like you were offending Baptists, but you know what, a whole bunch of Baptists got free of religion. And then when I came to your house, you dealt with the Catholics and a bunch of us that had Catholic in the background got delivered of Catholic doctrine which is not the doctrine in the bible, neither is Baptist, neither is Methodist, neither is any denomination. I remember when you dealt with some of us Methodists. The first devil I ever saw was a devil that I got in church and I saw it come out of me, and once you see it with your eyes and I felt it come out of me, I can’t argue any more that people have devils. You’re going to watch some divining spirits come out of Methodists, Baptists and everybody else that is close to the power of God. Kathie: And that is a blessing. September/October 1971, Hollywood, Florida, on a Thursday afternoon, God told me to pray for revival in North Texas. Well I did, and do. Doyle: That he did. I closed my bible study down, too, but not forever. Kathie: And what did God do with you then? Hypocrite. Why? Because of motes and beams. I shut it down, it was in my home. The people that came said, “Doyle, there’s no one that can teach this bible but you.” I said, “Well you better find someone else because I am not going to be called a hypocrite by God.” I don’t care what you say, but when God tells me I’m a hypocrite I say, “I quit, I resign.” Oh, I can’t stand them. Kathie: And what did God do with the hypocrite? Doyle: He delivered me from a spirit of sorcery that I got in church. My head felt like it was going to split. I love people raised in church, they’re potentially the most demonized people you’ve been around. God delivered me from that spirit. Kathie: And after he delivered you? Doyle: Oh, I could cast devils out of anybody [Kathie: There you go.] and I do. If you have a devil, I want you to know, your devil is in danger of being moved out of your body, whether you like it or not. Doyle: When you came here that was my attitude. “Devil go, or go with the person that you’re in.” I think I’m about to cast some devils out, don’t you? To the one that in the dark said to me, saith the Lord, ‘Why have you deceived me?’ I say to you, I have not deceived you; I will do what I promised you and I am here to deliver you but you must walk the path that I have laid before you and you must walk with your eyes on me, not turning to the left and not turning to the right, but keeping your heart and your mind and your eyes on me saith the Lord. The word is nigh thee, even in your heart and in your mouth, that is the word of faith which I preach, if you will confess with your mouth the Lord Jesus and believe in your heart that he was raised from the dead you shall be saved, for with the heart man believeth unto righteousness, with the mouth confession is made unto salvation. Glory! ...Well look, something meaningful just happened. Right. But oh, when you see this mighty angel, strong angel, rugged looking, a warrior. Oh! You oughta’ see him look at me like, “I’m ready, I’m a fighting warrior.” Glory! You think that doesn’t encourage me?” [Kathie: Oh ya.] I guess you can tell, can’t you.? [Kathie: Amen.] You and I and David were talking this morning about the greatest time for this ministry is ahead of us. [Kathie: Amen] Well, Sunday, July 23rd I go off of television—twenty-six years of television. I went on television when I was fifty-two, fifty-two years old. This ministry started when I was forty-eight, God started it. I was fifty-two when I went on TV and I was on twenty-six years. I went on in 1984 and in 2009 I went off when Terry Mai went to heaven, off of TV. Two years ago, I was 83, I went on television two more years, World Harvest Television for twenty-seven months. They thought I was finished, they hoped I was gone, but I came back and was on DirecTV two hours on Sunday for twenty-seven months. I started that when I was eighty-three and now I’m eighty-five. I told you this morning God was showing me I had some age or something in my soul and he was removing it. Kathie: Can I share something that happened about ten minutes ago? Kathie: I was praying with all had in me, I was in my heart considering something completely different. The Spirit of God was in my spirit and he was talking, and all of a sudden he said to me, “Decrepit,” I said, “Decrepit? !” and I didn’t understand and he said, “Jesus died decrepit, there will be no decrepit people in the gospel.” He said, “Moses’ natural forces never abated and that’s the old covenant,” he said, “In the new covenant there is no decrepitcy.” He said, “Jesus carried it.” I didn’t see that; the chastisement of our peace was upon him and that includes our health and our age and everything that has to do with that. That’s why your friend Pete is feeling so much better. Doyle: Well, I’m going to say something: if it’s God’s will, I would like for the leaders of this ministry see this angel. [Kathie: Amen.] If it’s God’s will, I don’t try to move him, but oh he inspires me like, “Come on! We’ve got an angel and God’s angels.” And who are they fighting? The devil’s angels, in the heavenlies! Kathie: You know Daniel had an angel, his name was Michael. Doyle: Right, right, Michael, then Gabriel helped, right? Kathie: Right. Michael was the angel over all the armies. 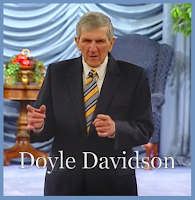 June 2008 during a Sunday morning Live Stream broadcast Doyle said, “God sent my ancestors to this country so I could preach the gospel.” He knew God was talking to him for he had never entertained such a thought. One of his aunts had done some research of the Davidson family and a cousin on the Miller side had researched the Miller line, especially their military history. “Frankly” Doyle said, “I was never very interested in learning about those people—I was busy living, making my mark on the world and believe me,” he says, “I had a lot of ambition.” God began leading him and others to research their ancestors and the information God has been revealing has continued to confirm those words spoken in June 2008. According to research, the Davidson’s initially settled in Virginia in the 1600’s and from that time continued to push westward as did all his ancestors in an extensive family tree. It seems that so many of the families that formed communities which are reflected in old tithe and tax records and the early census’ made decisions to migrate together because the same names would again be found, recorded in the census books, living next to each other in the new county or state. Information compiled by a family member states that Golden Davidson was a native of Virginia and his wife Sarah (possibly Wallace) was also born in Virginia. The family moved to Big Valley in east Tennessee about 1807 and later moved to Alabama about 1815. About ten years later, they headed north to Morgan County, Illinois in 1828, eventually locating near Quincy, Illinois in 1833. They are both buried about five miles north of the town that was there at that time. Joshua Davidson, Golden’s son, was born in Virginia in 1792 moving with his family to Tennessee where he married Elizabeth Sharpe who was a native of North Carolina and daughter of Henry and Elizabeth (Mosier) Sharpe. Joshua and Elizabeth were married in Claiborne County, Tennessee. They lived in Alabama for a time, but eventually followed Golden north to Illinois where they are both buried in Macoupin County, Illinois. Joshua’s son and Doyle’s great grandfather, James Madison Davidson was born in 1834 in Macoupin County, Illinois and married Louisa Mariah Norvell in 1858 in the same county. They moved to Jasper County, Missouri, being listed in Sarcoxie in the1870 Federal Census. Their son, Luther Albert Davidson was born in Sarcoxie, Jasper County, Missouri and married Georgia Long in Sarcoxie, Missouri. The Sharpe family came to Tennessee from Pennsylvania in the early 1700’s and Henry Sharp (Sr.) and brothers and sons established Sharpe’s Station (in Union County) and according to historians, it was one of the first two settlements west of the Appalachian Mountains. Henry Sharpe (Henry Sr.) married Barbara Graves and her family also migrated from Pennsylvania to Tennessee. It is believed Henry Sr. moved to Preble County, Ohio and is buried there. His wife Barbara is listed as buried in Union County, Tennessee. Barbara’s parents are buried in Union County, Tennessee also. Henry and Barbara’s son, Henry Sharpe, Jr. and his wife Elizabeth remained in Tennessee at Sharp’s Station and are both buried there in Union County. James Norvell, father of Louisa, was born in Sumner County, Tennessee in1804 and died in Modesto, Macoupin County, Ilinois where he is buried. He married Lavinia Elizabeth Harris in 1834 and Louisa their daughter was born in Illinois in 1839. The Norvell family also settled in Virginia, it appears as early as 1635. They remained in Virginia, moving a number of times throughout the years until they migrated to Sumner County, Tennessee by at least 1803. William Norvell, James’ grandfather is buried in Sumner County. William Jr. married Mary Payne in Virginia, before the families moved to Tennessee. At least two of their children (including James) were born in Tennessee and they may have lived in Alabama for a time before moving to Illinois in 1828, according to Norvell family histories. Mary Payne’s family also came to Tennessee about the time the Norvells arrived in the state. Mary’s father, John Payne is also buried in Sumner County, Tennessee. Georgia (Long) Davidson’s parents were Jefferson and Margaret (Whitaker) Long. Jefferson’s father, James Long was born in Tennessee, according to Federal Census records and married Sarah Greenwood, who was also born in Tennessee. The Greenwood family is also traced back to Virginia, information available reflects the family settled there in the late 1600s. James and Sarah were married in Illinois and James is buried there. At this time it is unknown if Sarah was buried in Illinois. Margaret (Whitaker) Long was born in Tennessee. Her father, Thomas Whitaker was born in North Carolina but moved to Tennessee as a child. He married Mary Peery in 1836 in Maury County, Tennessee and they moved to Jasper County, Missouri in 1855 and six months later in 1856 Thomas died from a spinal infection or affliction of some sort. Both Thomas and Mary are buried in Reeds, Missouri. Mary( Peery) was born in Hickman County, Tennessee. Mary’s parents were John and Rebecca (Dickey) Peery. Thomas Whitaker’s parents were Jacob and Mary “Polly” (Reading) Whitaker who were both born in North Carolina and were married there. It appears all their children were also born in North Carolina therefore it seems it was during their later years they moved to Tennessee where they are both buried in Maury County. Thomas and Mary’s daughter Susan wrote: “My father’s mother, Polly Redder [Mary “Polly” Reading] who had the Indian blood moved to Murray [Maury] County, Tenn. from North Carolina and died there.” She also wrote about her maternal grandmother: “I saw my mother's mother [Rebecca (Dickey) Peery] who was the Indian. She lived in Murray [Maury] County, Tenn.” Available information lists both John and Rebecca Peery are buried in Maury County, Tennessee. "I am 58 years of age; was born in Murray County, Tenn. I claim Cherokee Indian blood through my father and mother. I have been taught all my life that I had Cherokee blood. My father was born in North Carolina and my mother in Hickman County, Tenn. I never saw my father's parents. I saw my mother's mother [Rebecca Peery] who was the Indian. She lived in Murray County, Tenn. My father's mother, Poly Redder [Mary "Polly" Reading - wife of Jacob J. Whitaker] who had the Indian blood moved to Murray County, Tenn., from North Carolina and died there. My father [Thomas Whitaker] moved to Missouri in 1855 and died in 1856. My father nor mother never received any Indian money from the government. I have never gotten any Indian money from the government, never tried to get any before this time. I never got an allotment from the Dawes Commission." - Susan Whitaker Stevens [daughter of Mary (Peery) Whitaker]. During the process of researching, Doyle received records that had been hand copied from a Whitaker family bible, by his aunt, Neva Davidson Dodson. When Neva was twelve, she went with her grandmother, Margaret (Whitaker) Long-Renfro to visit John A. Whitaker and copied the family genealogy and signed her name. [See attached photo.] The note was recopied in 1947. Her handwritten record confirms and substantiates information from other sources including the source note written by Susan Whitaker Stevens. Research also revealed that the Millers can be traced back to Rhode Island, where it was discovered that a number of founders of the state of Rhode Island are ancestors of Doyle Davidson and David Kaspareit. These men and their families arrived in America about 1636, having left their homes and possessions to come to a country where they could escape religious persecution and obey the doctrine of the Lord Jesus as they understood it. Stukely Westcott, Ezekiel Holliman, John Warner and Samuel Gorton are ancestors that both Doyle and David share. Plus others of this group, Obadiah Holmes, John Crandall, Chad Brown and William Wickendon are also David’s ancestors. Gorton came to Boston from England, and in his own writings he stated: "I left my native country to enjoy the liberty of conscience in respect to faith towards God, and no other end." David Kaspareit learned in his research of his ancestors that he was descended from sixteen Mayflower passengers, two of those have been documented and accepted by the General Society of Mayflower Descendants: Captain Miles Standish and John Howland. Sadie Peters has also joined the Society, proving her lineage to William Bradford. Kathie Davidson and others are also proving their lineage to the Mayflower. In the process we have learned the Pilgrims or Separatists, as they called themselves had with much difficulty left England to settle in Leiden, Holland to escape the persecution from the Church of England. Holland was a much more religiously tolerant place. The Separatists did not accept the king of England as head of the church, nor “all the popery” and they did not believe it was possible to remain and stay true to their beliefs. Because of the influence of Dutch society on their children and the tremendous harshness of life in the Netherlands, they again left all that was familiar and sailed to America, landing at Plymouth in 1620. Out of 102 passengers, nearly half of them died the first winter. By the 1630s, the Puritans began arriving in America and one of the largest groups was led by John Winthrop on the Arabella along with eleven other ships. The Puritans are often confused with the Pilgrims or Separatists who came on the Mayflower. Puritans wanted to remain with the Church of England and change it from within. William Bradford, Governor of Plymouth wrote, “It was the Puritan's aim to reconstruct and purify not only the church, but individual conduct and all the institutions men live by.” What seems most amazing, they left England seeking religious liberty, and upon arriving in Massachusetts, immediately set up a new church government as strict and severe as in England The Pilgrims at Plymouth, who practiced a greater liberty were soon overwhelmed by the influence of the Puritans and by the time Roger Williams, Samuel Gorton and the others arrived in New England, they found the liberty they sought wasn’t here, the liberty practiced was only liberty for the ruling magistrates and not for their fellow Christians. Samuel Gorton wrote: "I left my native country to enjoy the liberty of conscience in respect to faith towards God, and no other end." The majority of those that eventually founded the area of Rhode Island separated from Massachusetts Colony, either voluntarily or by banishment because of the doctrine they practiced and their commitment to liberty for all men. They believed in baptism by immersion for believers, those who confessed Jesus and rejected infant baptism. This belief was complete heresy to those of Puritan beliefs. They formed friendships with the Indians of the area, purchasing land from them rather than taking it by force. There continued to be continual strife and harassment both within the communities and without. The Puritans of Massachusetts Bay Colony were determined to stamp out what they considered heretical doctrine and they continued to pursue all those who disagreed with them. Samuel Gorton, Roger Williams, John Clark and others did not believe the government could dictate the conscience of men; civil authority had to be separate from the church. Many of these men were arrested, beaten and jailed numerous times and it didn’t seem to matter how many miles they put between themselves and the Massachusetts Bay Colony’s legal jurisdiction, the harassment never ended. Their livestock were confiscated, their homes burned and it finally came to a place where a number of them were arrested and convicted—though the final charge was heresy. They were actually sentenced to death, but there was such a public outcry that they ended up being sentenced to hard labor. One man died from the hardship, the others were eventually released, but only because the authorities were forced to concede to public opinion. They were threatened with death if they ever returned but that meant no matter where they went because the ruling government of Massachusetts was determined not only to completely eradicate what they considered heretical doctrine, but they saw the wealth of that area and thought nothing could stop them from claiming it for Massachusetts. Samuel and his colleagues were welcomed back to Shawomet by their Indian friends with great rejoicing. Gorton was a brilliant and well educated man, though self-taught and he had brought an extensive library with him from England. He knew English law better than any who were trained as lawyers. He and the others knew they would never be able to live peaceably without a charter from England and Samuel Gorton, John Green and Randal Holden, sailed to England to make their case. Samuel Gorton returned to New England four years later with a charter for Shawomet in hand and in honor of the Earl of Warwick, he changed the name of the settlement to Warwick. Roger Williams had earlier secured a charter for Providence Plantation which included Providence, Portsmouth and Newport. The odds that they could thwart the plan of larger Massachusetts Bay Colony, highly favored in England, seemed impossible, but the little group believed their cause was just and God surely upheld them and delivered their oppressors into their hand. This group of men in Rhode Island were advocates of religious freedom and the separation of church and state. One historian is quoted as saying that the government that had originally been formed on Aquidneck Island by Gorton and associates at Portsmouth, “operated like leaven in diffusing itself through the minds of the masses and formed the nucleus out of which sprang the Declaration of Independence.” Samuel Gorton was a leader, not only in civil affairs, but also in spiritual matters—he was a student of the bible and one cannot read about his life and not consider that God had raised him up for that hour. History has recorded: but for the tenacity and perseverance of this group of men, in the face of tremendous persecution, our government and nation might look very different. For more than thirty years Doyle has proclaimed publicly on radio, television, satellite, and short-wave radio throughout the world that the gospel is Jesus died, He was buried, and He rose again the third day—that is the gospel. Sources: The Life and Times of Samuel Gorton by Adelos Gorton; Neva Davidson Dodson family history. Where you gonna’ go? Where are you going to go?! My words are words of eternal life and your life, your eternal life begins the moment you are born again. You are in your eternal life, where are you going to go? My words are eternal life, humble yourself and let me deal with you. I have never lost one yet. 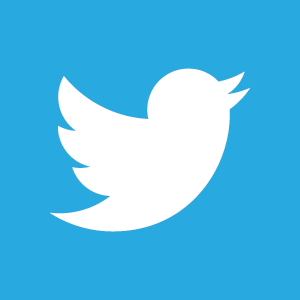 I have never lost any, only one and he is the son of perdition and it was made to be so. I have never lost one. Where are you gonna’ go? Humble yourself and let me deal with you, let me walk the walk, let me lead you in the walk I have prepared for you and when you do then I will bring you into the place that I have prepared for you and it is much, much more than you could have ever imagined. In 1970 God took me out of my veterinary practice, took me out from following the horses and said, “Obey me,” and in 1974 God anointed me to preach the gospel in Jerusalem at the Garden Tomb. God has been with me all these years, he has never let my foot slip and he has taken my enemies out of my sight. I can say the same, the Lord God knows me and I know Jesus and I know my Father, Jehovah. When I was in Argyle in 1975 God ministered 2 Samuel Chapter 7 to me, convinced me, that I like David, had a ministry that endured forever. The words he spoke amazed me. Just as King David said, “Who am I O Lord God?” those were my thoughts, “Who am I Lord?” I prayed verse 25 hundreds of times, assured that what God was saying was, he would do the same for me, build me a house and establish it forever. It was in my heart. Today I am more convinced. God has built me a house and given me a people; he has chosen me and sent me to the four corners of the earth to deliver his word, the table is set, the time is now. Since 1970 I have learned and am still learning how to walk in Psalm 91. Notice the writer states, “I will say..” You have to talk right. Jesus states in John 14: 23 Jesus answered and said unto him, If a man love me, he will keep my words: and my Father will love him, and we will come unto him, and make our abode with him. How do you know you have set your love upon him? Back to John 14:23, Jesus answered and said unto him, If a man love me, he will keep my words: and my Father will love him, and we will come unto him, and make our abode with him. I am 85 years old, living a long life and I am not ready to stop living. I am always looking and expecting God’s salvation. I the Lord will say unto you, my kingdom is an everlasting kingdom; my kingdom is not in word only but it is in power; my kingdom is not of this world; my kingdom is above every nation; my kingdom is above every people; my kingdom is above every culture. My kingdom reigns, my kingdom reigns over every culture, every people, every kindred, every nation. I walk in that kingdom, I brought that kingdom to you and in front of Pilate I had a good confession that my own people delivered me up because I would not walk in their ways, I would not do their ways, I would not walk after their tradition, but I only spoke what my Father spoke, I only did what my Father did and my own people delivered me up. You must be willing; you must be willing to lay down your tradition. You must be willing to lay down your tradition and only speak my words and only do my works, and only walk in my ways, and if you are willing, then I will raise you up and you will do exploits and I will use you to bring to me a people, a nation of mighty people that I can come back after. On Wednesday September 23rd, 2015 during the 11:00 AM broadcast (He That Loveth Me Keepeth My Words) I made this statement, “It’s a great morning, great things imminent, great things.” On this day, I could sense the anti-christ spirit of Daniel 11:20-28 and it was difficult for me to stand under the pressure. Wednesday evening's broadcast (God Is Judging The Spirit of Sorcery). The next day, when I opened the broadcast I said, “Well I don’t know what I’m going to say but I tell you what the Psalmist says, open your mouth wide and God will fill it and that’s what I’m going to do,” and I began to pray: “At the name of Jesus every knee shall bow, things in heaven, things in earth and things below the earth and every tongue shall confess Jesus Christ is Lord to the glory of God the Father and we played recorded Water of Life Boys songs while I continued to pray. While I was praying I saw something I have been seeing for a number of weeks, a man’s face with wolf hair on his nose, God shows me oftentimes in a vision what I’m wrestling with, and I have seen this man, or it is possibly two men that are wolves. But I am not a hireling, don’t think I will flee…I will not flee. "Hebrews 4 12 For the word of God is quick, and powerful, and sharper than any twoedged sword, piercing even to the dividing asunder of soul and spirit, and of the joints and marrow, and is a discerner of the thoughts and intents of the heart. Notice this word divides the soul from the spirit; it is sharp, and it hurts. 23 And I will beat down his foes before his face, and plague them that hate him." I was joined by David Brown and Paul Peters on set during the 11:00 AM broadcast. That standard is Jesus Christ the man crucified and raised from the dead, seated at the right hand of God. For in that he himself hath suffered being tempted, he is able to succour (aid) them that are tempted. 10:00 AM Broadcast: I talked of the Lord confirming to me in the 1970’s at the Royal Coach Inn that he “was restoring to my church, the apostle, prophet, teacher and evangelist ministry.” I confronted the spirit of those who talk of the spirit of Elijah. "On my broadcast this morning I introduced Terre Brown as born again, baptized in the Holy Ghost speaking in tongues, yet her soul loved the world. The Lord said through me, "That is typical of the Charismatic movement." Lasciviousness: (Strong’s, Thayer's Greek Lexicon) unbridled lust, excess, licentiousness, lasciviousness, wantonness, outrageousness, shamelessness, insolence. Who is exempted from this list? “On Wednesday September 23rd, I could sense the anti-Christ spirit in Daniel 11:20-28, it was difficult for me to stand under the pressure. Thursday and Friday the same pressure and Sunday, pressure. I did both programs, morning and evening and Sunday evening, the power of God started rising in my heart. That was when God began putting the sins of God’s people out of my heart. When I woke, my body felt rested and peaceful, it still does, but I can tell I am entering the war zone. The light is getting brighter and I can see well enough to shave. Servant and apostle of the Lord Jesus Christ"
This is what God did with me. He sold 121 Veterinary Hospital and my house in McKinney." Weeping with opening (Blessed is the Man that Endureth Temptation) and had been boldly talking to the Father and the Son since 9:00 AM. “I need the prayers of all God’s people. I am living in Psalm 143 and I am doing everything these scriptures say that a servant should do. I cannot eat or keep liquids down. I trust in the Lord. The Lord is my light and my salvation; whom shall I fear? the Lord is the strength of my life; of whom shall I be afraid? (Psalm 27:1) I have asked forgiveness from several people of anything I have said or done that would offend them. I have forgiven everyone of all of their trespasses toward me." I still have the strength to walk and I will be on the set at 11:00 AM CT if the Lord permits. I continue to try to drink water however I don’t think very much if any stays in my stomach because I continue to regurgitate. I will say on Thursday I was able to drink 16 ounces of water and keep it down. I am not afraid, I am a bit puzzled. I do rejoice greatly that I can still pray. I had KD read to me part of Elliot Hodge’s testimony (the accident by the shotgun blast and on). She read this to me about two weeks ago and at that time I wondered what the Lord was going to let happen to me. The Davidson’s were friends of Elliot Hodge and I have heard him speak. I said that the grace that was on Elliot Hodge was given to the Davidson’s and I am one of them. "2013, 2014, and 2015 have been the most difficult years I have ever experienced. It has been difficult even hearing the Lord yet He has held me up and come to my aid several times. But in all this, there has been many victories. Here we see that many that were vexed with a devil were healed. For many years I cast one devil after another out of God’s people. Every devil that I cast out was a healing. And now fighting with all of God’s people and their devils has brought my soul to this low level. And my spirit is overwhelmed within me. But God’s mercy never ends. “September 2008 I bound witchcraft for more than seven hours and had little strength. Terry and Kathy’s song was playing in the Fellowship Hall, “I Proclaim”. Within minutes I was fine. But then within weeks my vision started weakening because of my persecutors. I need the prayers of all God’s people. The Antichrist spirit cannot bring me down. Shared of Alba, my mother speaking the name of Jesus for thirty minutes and being healed. She couldn't eat or drink, well I can’t eat. "Two days ago I was reminded that the Apostle Paul on the ship in a great storm was fasting until fourteen days (Acts 27:33). Well, today is my 14th day. I ate a few bites of custard pie last night. This morning about 10:00 AM I had about 9 or 10 bites of custard and had the same three more times today. Plus since this afternoon I have had 5 small slices of cheese and 5 crackers. Saints, I am doing well! "I just finished yesterday two weeks of fasting. I now weigh 148.6 lbs (my normal weight is about 170-175). I have been up since 2:00 AM praying. I am strong, healthy, encouraged, and zealous for the will of God. I am preparing to have a small breakfast of custard pie, orange juice and coffee. See you at church or on-line! 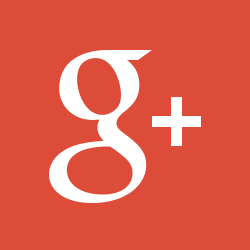 Posted the song “Holy Highway” and Isaiah 35. "After two weeks of God putting me on a fast he delivered me from a fearful heart. I am grateful. I want to give thanks to God for Lester Sumrall who shared how God delivered him from fear and after that he was not afraid of anyone. I can say I have the same testimony. Servant and apostle of the Lord Jesus Christ."